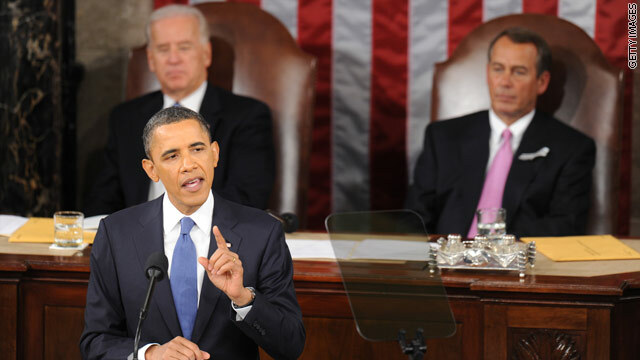 Washington (CNN) - A majority of Americans who watched President Obama's State of the Union address said they had a very positive reaction to his speech, according to a poll of people who viewed Tuesday night's address. A CNN/Opinion Research Corporation survey indicated that 52 percent of speech watchers had a very positive reaction, with 32 percent saying they had a somewhat positive response and 15 percent with a negative response. The 52 percent who indicated they had a very positive response is up four points from the 48 percent of speech watchers who felt the same way a year ago about the president's January 27, 2010 State of the Union address. "Tuesday night's State of the Union audience is more Democratic than the nation as a whole, which is typical for a President Obama speech and indicates that the speech-watchers were predisposed to like what Obama said," noted CNN Polling Director Keating Holland. "When George W. Bush was president, his audiences were more Republican than the general public at that time, and his speeches were usually well-received for that same reason." The CNN/Opinion Research Corporation poll was conducted after Obama's address, with 475 adult Americans who watched the speech. The survey's sampling error is plus or minus five percentage points. During his address, the president made a bid for bipartisanship, saying "new laws will only pass with support from Democrats and Republicans. We will move forward together or not at all - for the challenges we face are bigger than party and bigger than politics." The poll indicates people who watched the speech like that message. Sixty-one percent say that the president will succeed in increasing cooperation between the parties. And just over seven in ten say that Obama's address was about right, with 23 percent saying it was too liberal and five percent saying that it was not liberal enough. Seventy-seven percent say the speech made them more optimistic, with just 19 percent saying it made them more pessimistic. Sixty-eight percent of speech-watchers who were questioned said the president will succeed in improving the economy, with 61 percent saying Obama will reduce the deficit and 57 percent saying he'll succeed in creating jobs. The survey also indicated that before the speech, 61 percent of people questioned said they thought Obama's policies will move the country in the right direction. That increased to 77 percent when questioned after the speech. Nearly nine in ten say it was a good idea for Democratic and Republican lawmakers to sit together during the speech, with just seven percent saying it was a bad idea. Earlier this month, Democratic Sen. Mark Udall of Colorado proposed that members of both political parties sit next to each other instead of the normal separate seating for Democrats and Republicans, in a move to reduce the divisive political discourse of recent years. Udall suggested that the traditional choreographed standing and clapping during the State of the Union address would be unbecoming of Congress, especially given the recent shootings in Arizona. What then is David Gergen talking about? I use to respect the man's opinion but not anymore. He's too partisan (Republican side I mean) to be objective about the President. What on earth has happened to CNN political coverage? I haven't watched CNN for a couple of years now, and if tonight is any indication, I certainly won't be watching again anytime soon. ARE there any adults left at CNN , and if so, will they PLEASE step up to the plate to stop this nonsense of constant and irrelevant criticism directed at President Obama. It is, to say the least, not worthy of a major news network. Great speech with a great visions and a clear view what needs to be done by all parties and people. Republicaan response is negative, do nothing and oppose and protect special interests while pretending working for voters. Seriously, who are you polling? are we grading public speaking because all it is are words. Do something already! These stats shown on CNN are an embarrassment to honest statisticians. Couldn't they find a few more republicans to have an equal number of voters weighing in? CNN is so in the bag for the democrats. AC360 was a showcase for liberal bias and misinformation. Sad for a network that started as a great news channel. Pathetic speech for a pathetic President. positive speech by obama. warm, forward focused, bolster the stock market! Create independent wealth (in all areas $$, education, moral) models. Keep up the dominant forward movements: mobile connectivity, fast speed transit "coupling" cars (low energy alternatives) new infrastructure ala Hoover Dam! etc....new job creation, training. A good spin CNN. How can you run a poll in less than 10 minutes from the time the speech ends to posting this story. I liked it – especially the call for Republicans to stop obstructing everything and start working FOR THE AMERICAN PEOPLE INSTEAD OF THEIR PARTY. "So I say to this chamber tonight, instead of re-fighting the battles of the last two years, let's fix what needs fixing and let's move forward." I really don’t think politicians have a good understanding on the problems with America’s educations system. For large cities like San Antonio that have over 16 districts. We see a large division of the quality of education. We have poor districts that are seriously thinking of closing some schools and reducing from 5 school days per week to 4 days. We do have a couple of districts that are performing very well and are funded pretty well. Their success is mainly due to families are moving from the poor districts to the stronger districts. I strongly think that if the city would have one district administration with a winning track record to manage all districts would improve education as a whole. Eliminating redundancy of administration cost would provide schools more opportunities for reform and raise the salaries for teachers. Also, teachers that are successful in these stronger districts can cross train other teachers that are not so successful in areas where needed. I also, would suggest this new centralize district work closely with the city’s planners for future growth so that building permits are issued in a way that schools are better prepared. I truly believe that if this new centralization of administration and standardization of educational practice, the city would be a more balance community. If you have a city that is balance with education, you would see a reduction of the following; student drop-outs, un-employment, crime, dependency of state assistance and social division. You would also see an increase of the following; housing re-development, small business, employment, local college administration. Last feable effort of an individual who is in way above his head. A meager effort to mimic JFKs effort to challenge " America to "put a man on the moon and return him safely to earth before the end of the decade". Obama is no Kennedy. He makes it up as he goes along. If you want a Sputnik moment, stop taxing the private sector. Truely come up with tangible goals. What about high speed trains between NY and LA Chicago to Miami before the end of the decade. THis would create jobs and would leave a legacy that Obama is sorely lacking. Talking about Sputnik, what about funding NASA and dropping the request that he made to Nasa administrator last year, requesting that "NASA should work towards making muslim countries feel important" (I am not imagining things, this is public record). Obama is a feable leader, nationally and most importantly internationally. He would have been a good leader 10 years in the future. Now he is just a little boy trying to be president. It is a shame. Now that America has shown that we can vote an African American as president, next time lets vote for one who has the experience required and is more than a dreamer and an empty suit. More of the same drivel. He's run up astronomical deficits as far as the eye can see, blown the debt through the roof and now wants us to believe he's some sort of government cutter? Next joke. If this idiot has a talent, it is for giving a great speech and then doing the exact opposite. To many platitudes and no specifics for the most expensive president in US. history. ...definetly a thumbs down!! Bachmanns speech was irrevelevent. We are trying to mold together and grow as a nation. We could have saved money by eliminating her speech all together. I feel better after listening to President Obama. He is genuiely trying to take this country to the next level, he has our best interest in his hands. I think he did an awesome job. Good for him and all of us on both sides of the aisle. We are all in this together. It was boring....more than half liked the speech? I thought he was rather bland. It was a very flat and the same talking points-just that it was at a different place and time. 52%, more lies from CNN. Where did you take this poll? Obama was out of touch, incoherent and looked and sounded like he has not clue what is going on in the country. We are at depression levels of employment in America our government debt is at crisis levels, Obama needs serious help.